The franchise that helped create the space combat genre is preparing all flight systems as Atari, one of the world’s most recognised publishers and producers of interactive entertainment, brings the iconic Star Raiders® to next generation platforms. The return of Star Raiders will combine tense aerial assaults and dogfights with a compelling new storyline, striking visual style and exhilarating single and multi-player gameplay. Atari will look to recruit a new generation of gamers when Star Raiders shoots onto the Xbox 360® video game and entertainment system from Microsoft, PlayStation®3 computer entertainment system and Windows PC Download in early 2011. Originally released in 1979, Star Raiders became the first ever first-person space combat title, inspiring several generations of “space combat simulation” titles throughout the 80’s and 90’s. This exciting new take on this Atari treasure will pay tribute to the original while ushering in an all new, captivating episodic experience. Star Raiders will offer familiar battle elements including space warps and galactic tactical maps with all new features like radical battle transformations and customisable ships. 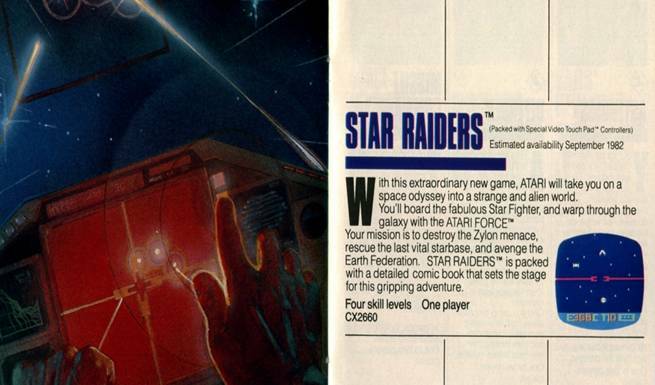 Moreover, the all-new Star Raiders will bring powerful online play to the franchise for the first time. Co-op campaigns and competitive team-based multiplayer will enthrall both original and new fans.